(2337, Judge John Shive Collection, OHS). As the county seat of Custer County, Arapaho is situated on U.S. Highway 183, five miles north of Interstate Highway 40. Named for the Arapaho tribe, the town came into existence on April 19, 1892, the day of the Cheyenne-Arapaho land opening. The word Arapaho means "blue sky men" or "blue cloud men." Prior to the opening a federal government survey platted the town, and a post office was established on March 23, 1892. The survey was accomplished in the fall 1891, and Arapaho was designated as the county seat of G County (which became Custer County in 1896). On the day of the opening four hundred participants staked town lots, and a tent city was born. Ten days after the opening Frank Fillmore and William C. Seaman printed the first issue of the Arapahoe Arrow newspaper in a tent. Renamed the Arapahoe Bee on December 31, 1892, the newspaper continued in publication until January 30, 1953. The community's first church, Methodist, was organized on April 29, 1892. Settlers soon established Christian and Congregational churches. By 1894 Arapaho had a wood-frame courthouse, a school, a brick plant, a blacksmith shop, and a wagonyard. Arapaho developed as a trade center for the surrounding agricultural area in which wheat and alfalfa were grown and livestock were raised. The Blackwell, Enid and Southwestern Railroad (later the St. Louis and San Francisco Railway) and the Kansas City, Mexico and Orient (later the Atchison, Topeka and Santa Fe Railway) built in 1901–03 and 1906, respectively, connected the town with outside markets. Because Arapaho was midway between El Reno and Cheyenne, it was a stopping point for travelers and freighters. The Coleman and Commercial hotels and two restaurants served itinerants. In 1909 Arapaho had a broom maker, a light and heating plant, a general store, a furniture store, and a meat market. By 1918 the Arapaho Mill and Elevator Company was in operation. In the 1940s Arapaho had one cotton gin, a weekly newspaper (the Arapahoe Bee), a municipal library, a bank, a school, and two churches. The library, opened in May 1904, filled the literary and social needs of the community. Rev. L. L. Legters, minister of the Reformed Church of Arapaho, was instrumental in establishing the facility. He garnered a one-thousand-dollar donation from philanthropist Frances P. Fernald, whom he had met while attending a theological seminary in the East. She also gave four hundred dollars for purchasing books. Legters's brother-in-law donated the first forty tomes to the fledgling library. Fernald and others in New York and New Jersey soon sent works to the library that bore her name. On March 2, 1905, the territorial legislature approved Council Bill Number 80, which legalized Arapaho's incorporation. On several occasions residents fought to retain the county seat. 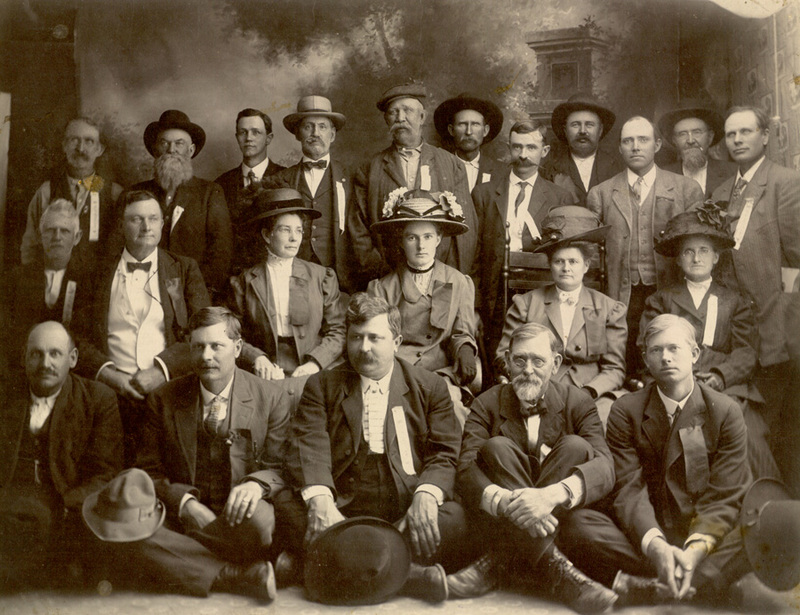 They competed against Clinton and Custer City during elections held in 1908, 1909, and 1921. Clinton, the strongest competitor, eventually conceded that the government offices should remain in Arapaho. Fire destroyed the first courthouse in 1896. Consequently, county business was handled in various buildings and in the Coleman Hotel until the Public Works Administration (PWA) completed a new courthouse in 1935. Oklahoma City architect Forrest Butler designed the building, and Sam S. Laughlin of Oklahoma City was the contractor. The two-story building cost approximately $100,000 dollars to erect. Expansion of the courthouse and renovation of the jail was completed in May 1985, at a cost of $3.7 million. In 1900 Arapaho's population stood at 253. It climbed dramatically to 610 at 1907 statehood and to 713 in 1910, declined to 326 in 1920, and rebounded to 414 in 1930. The federal census reported 401 in 1940, 311 in 1950, 351 in 1960, and 531 in 1970. The number peaked at 851 in 1980, declined to 748 in 2000, and rose to 796 in 2010. At the turn of the twenty-first century Arapaho citizens supported the Arapaho Elementary and Arapaho High schools, in which 202 and 79 students were enrolled, respectively. Industries that provided the highest percentage of employment were educational, health and social services, and public administration. Oklahoma Gov. Leon C. Phillips hailed from Arapaho. "Arapaho," Vertical File, Research Division, Oklahoma Historical Society, Oklahoma City. Trail of 100 Years: Arapaho, Oklahoma, 1892–1992 (Arapaho, Okla.: [The Committee, 1992]). Linda D. Wilson, "Arapaho," The Encyclopedia of Oklahoma History and Culture, https://www.okhistory.org/publications/enc/entry.php?entry=AR001.